NEW YORK (CNNMoney) -- Hey, millionaires! In case you haven't noticed, some members of Congress think you should pay more taxes. And now a group of Democratic lawmakers has introduced legislation that would make you big-earners do just that -- resulting in a tax hike of up to 40% for the wealthiest Americans. Currently, income earned in excess of $373,000 is taxed at a 35% rate. That's the top bracket. A bill -- introduced by Rep. Jan Schakowsky of Illinois -- would set a new rate of 45% for Americans who earn more than $1 million. The progressive hike would top out at a 49% rate for income in excess of $1 billion -- which would means those in that exclusive group would pay an additional 40% in federal taxes. Of course, the bill has no chance of becoming law. 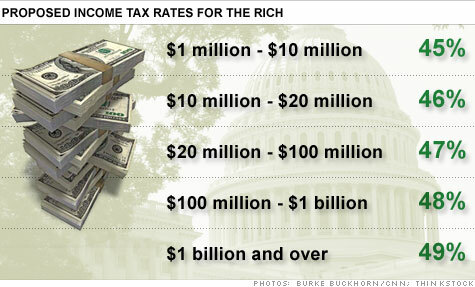 In December, Congress extended the Bush tax cuts for all Americans -- including the rich. Since then, anti-tax Republicans took control of the House. But the bill does bring something important to the budget debate that has been largely absent from the cut-crazy discussion in Washington. Cutting spending isn't the only way to narrow the deficit. Increasing tax revenue would help. "This isn't about punishment or revenge. It's about fairness," Schakowsky said in a statement. "It's about avoiding budget cuts that harm middle-class families and those who aspire to it." Schakowsky touts her bill's budget bona fides, saying the increase in rates would net more than $78 billion in increased revenue. Roberton Williams, a senior fellow at the nonpartisan Tax Policy Center, said the bill would likely result in increased revenue, but maybe not as much as Schakowsky expects. That's because wealthy people change their behavior when tax rates increase, using methods such as delaying compensation to lower their exposure to the new rates. In addition, there's just not that much money available. "You are focusing on a narrow part of the population," Williams said. "There just aren't enough people there." And just like the GOP's recent proposals to slash government spending, Schakowsky's bill only tackles one side of the revenue-expenditure budget equation. "This is not a compromise," Williams said. "It's a one-sided proposal." A spokeswoman for Schakowsky said the legislation is meant to drum up a discussion about the revenue side of the budget. What would be more productive, Williams said, is a broad plan that would reform the tax code -- including cutting back on provisions written into the code that act as spending, such as giving people a deduction for their mortgage interest. "You'd have more taxable income. You could bring rates down, have more revenue and not have these benefits that skew economic behavior," Williams said.